I received a finely painted flower etegami by Hideko, from Japan, along with a postcard of “緑の風のなかで”, by Iwasaki Chihiro. 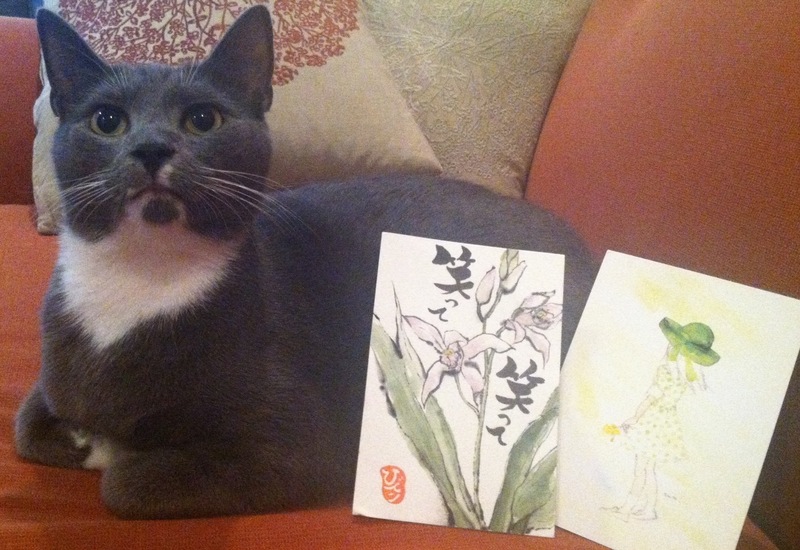 Hideko’s etegami says, “Smile, smile.” My cat Joxter is posing with the gifts — she’s not really smiling though! ← My Inbox: Nonbiri Oranges from Shungo! Thanks! Joxter proceeded to hide herself for about 12 hours… I thought I’d lost her! She was hiding from the house painters not the etegami.